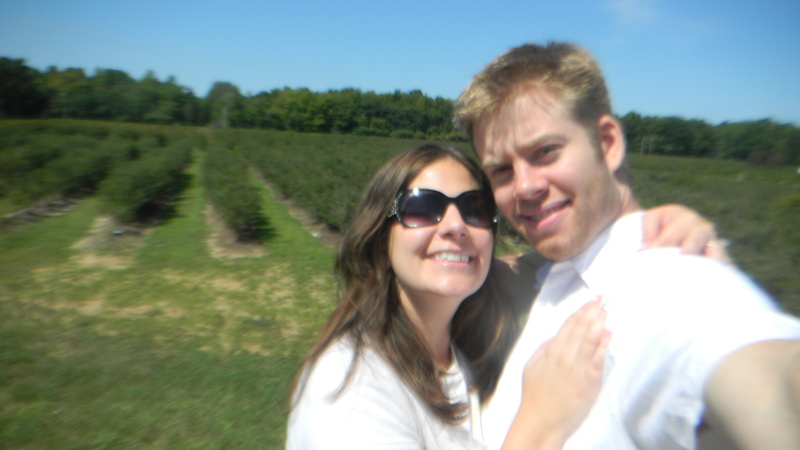 When Dan and I went on our Michigan trip, we spent our last hours there on a blueberry farm, picking our own blueberries. 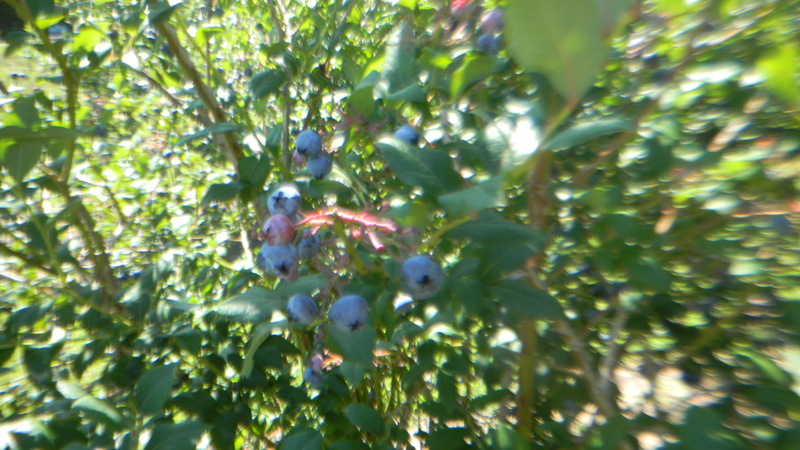 Did you know blueberries grow on bushes? Guess I never really thought about it. In any case, we ended up picking about 4.25 pounds in about half an hour. We gave some to my parents as a thank you for watching Phoebe while we were gone, but we were still left with quite a few blueberries in our fridge. They were so fresh and delicious, and I knew we needed to use them quickly, before they spoiled. 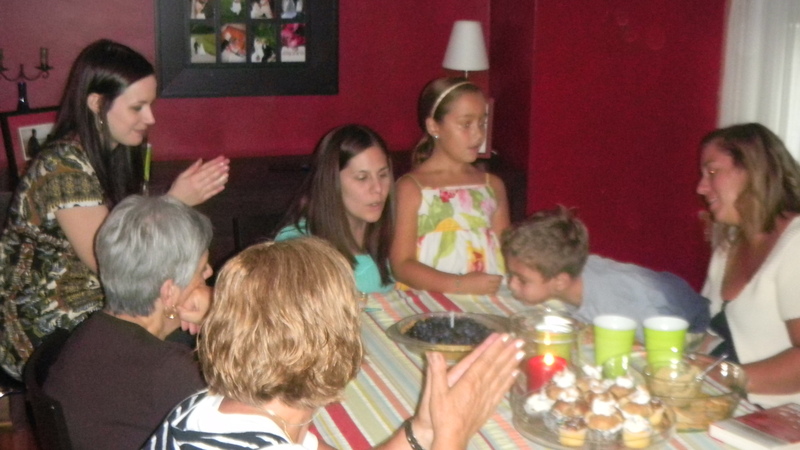 Luckily, I was having my family over to celebrate my birthday less than a week after we returned from Michigan. 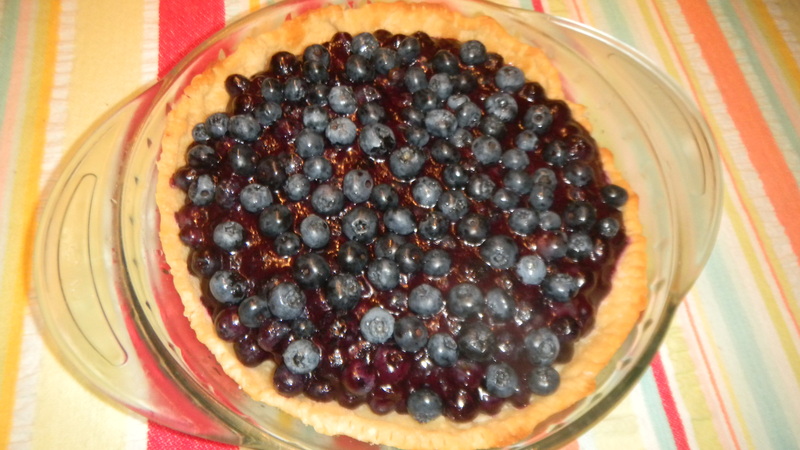 Dan thought that a blueberry pie would be a great way to use up those berries. He was right. As a time saver, we used some pre-made pie crust we already had. This recipe only calls for one of the two sheets that come in the box of store bought, refrigerated pie crust. You can add lattice or another design on top if you want, but I didn’t think it was necessary. Cook the pie crust as directed on the box, then set it aside. Dan found the recipe for the filling on Shockingly Delicious. 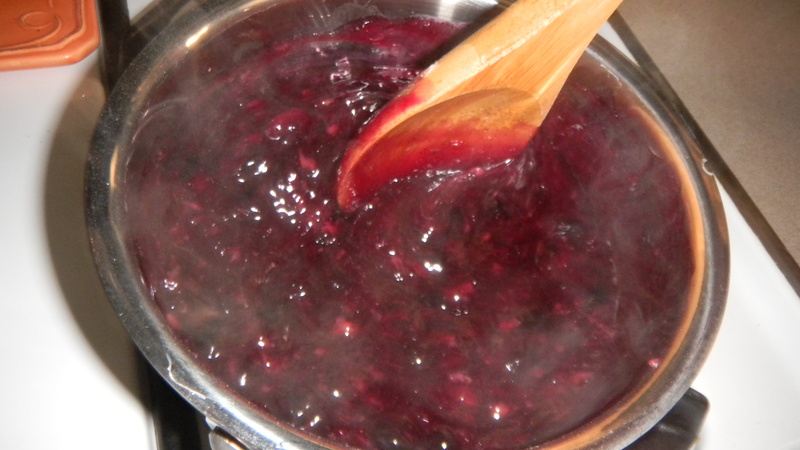 Put the sugar, cornstarch, salt, cinnamon, water, and 1 1/2 cups of the blueberries into a saucepan. Bring to a boil and stir, until thickened. While stirring, mash about half of the blueberries in the pan. Once the mixture is thick, take the pan off of the heat and add in the vanilla and lemon extracts and the butter. Let cool. Once cool, add in 2 1/2 more cups of blueberries. 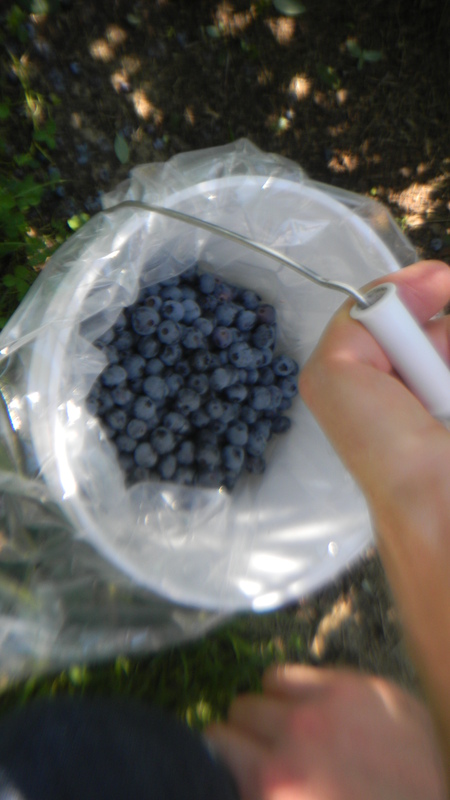 Pour the mixture into the crust and arrange the remaining cup of blueberries on top. 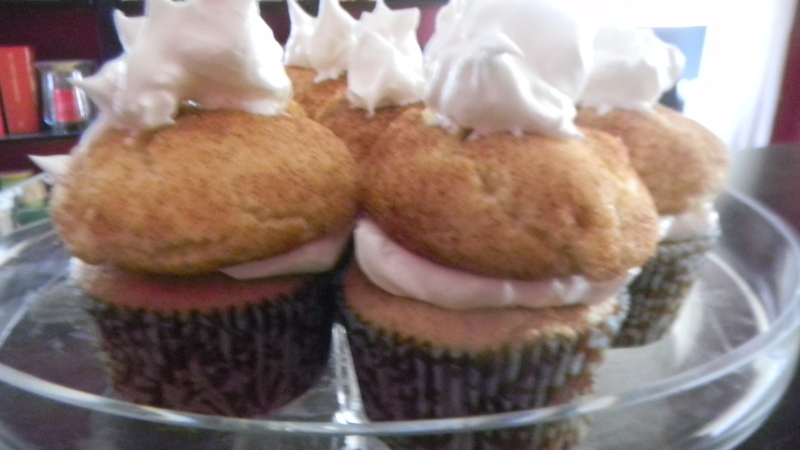 You can add powdered sugar, regular sugar, or raw sugar to the top if wanted, but we didn’t. Makes a great alternative to birthday cake. 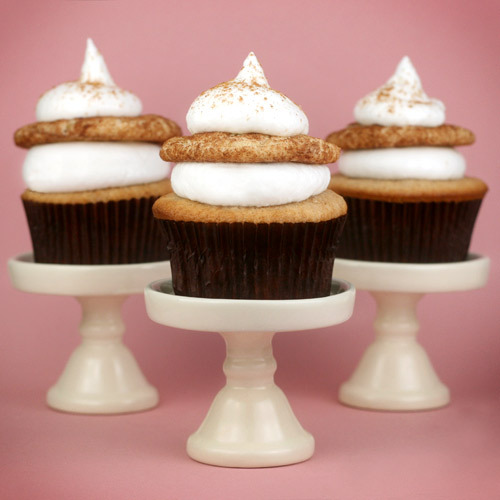 Going along with the fall theme from yesterday, I decided to feature a baked good that has autumn written all over it – snickerdoodle cupcakes topped with snickerdoodle cookies for double the snickerdoodle fun! I wish those were the cupcakes we made. Ours were tasty, but bakerella makes these look simply amazing. I’m pretty sure it’s the cinnamon smell that makes the whole house feel cozy when these guys are baking. Unfortunately, I missed most of that smell since I got home once everything was already out of the oven. That’s right, that means Dan made these wonderful treats 100% on his own! 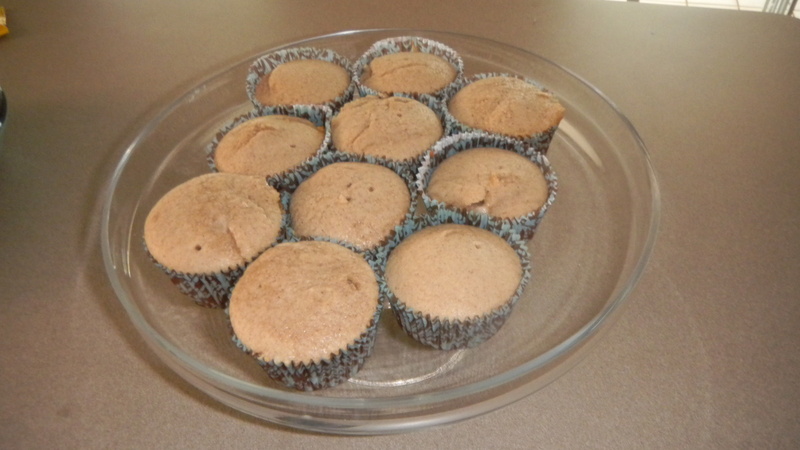 He followed the Martha Stewart snickerdoodle cupcake and cookie recipes exactly and got these to show for it. We used the recommended 7-Minute frosting too, and it was a perfect combination. I would advise making about half of the frosting recipe though – we had a lot left over. 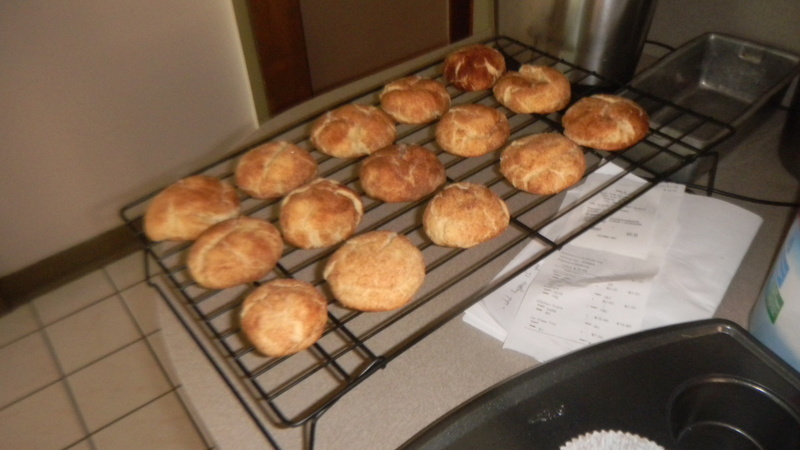 I would definitely make these again, and probably will at least once this fall. It has quickly shot to one of my favorites. As soon as the calendar gets flipped from August to September, decorations around my house go into overdrive. I’ve found there isn’t much to do decoration-wise between May and August (aside for some Fourth of July knick knacks), so once September rolls around, I’m more than ready to start decorating again. I get excited by the solid decorating run coming up for fall (in general), Halloween, Thanksgiving, and Christmas. As September 1 was last Thursday, I got right to decorating. 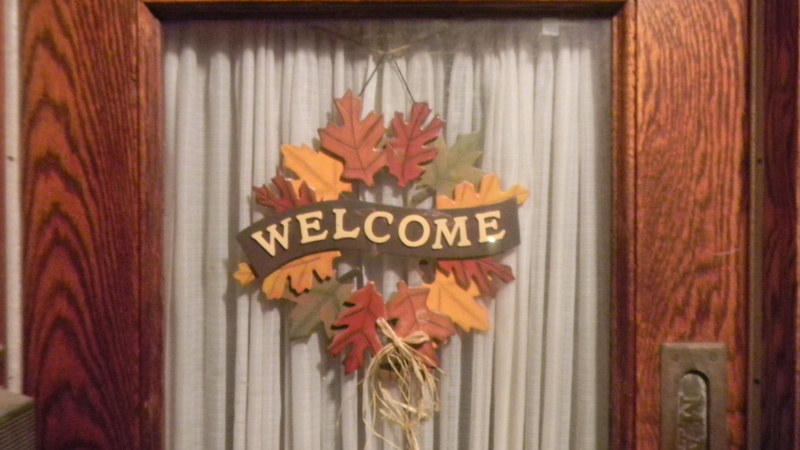 I started out with my Fall Leaves “Welcome” wreath. This was a Kohl’s find last year. On my front door it goes! 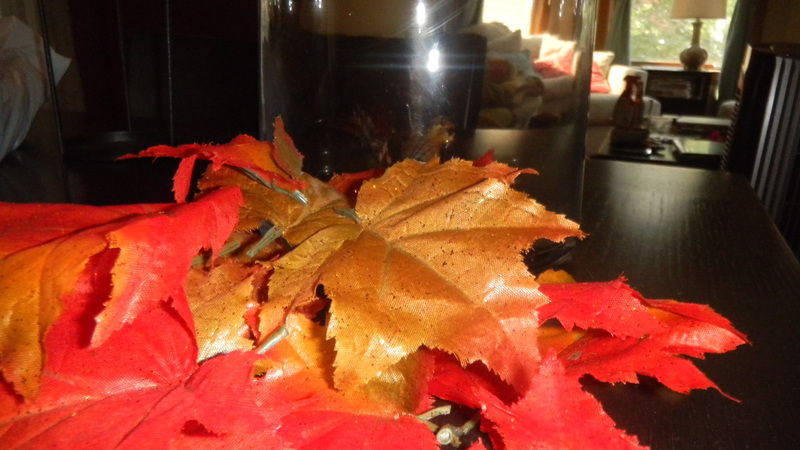 Next, out came all my fall smelling candles – spiced cider, pumpkin, and blackberry tea. I like to have a constant fall scent in the house, so I plugged in a Bath & Body Works Wallflower. My favorite scent is the pumpkin, but I save that one for October, since it seems more appropriate. For now, we’re constantly smelling warm apple pie. Another thing I’m really liking is my new candle decoration. The hurricaine jar is from Homegoods, found for $9 on clearance. I loved that the candle would hang inside the jar about midway, leaving the bottom portion able to be filled with seasonal items. 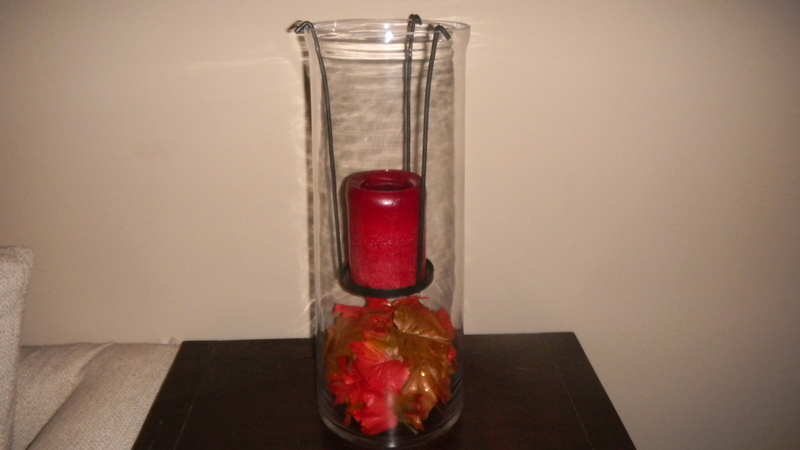 Currently, some Dollar Store fake leaves are sitting in the candleholder. I bought a branch of them, and cut each one off to place in the jar. 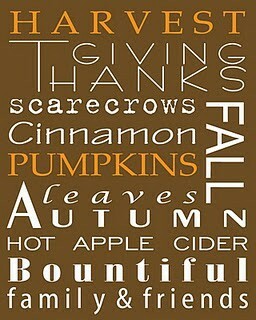 I plan to swap the leaves out for each holiday, like candy corn for Halloween and Sweethearts for Valentine’s Day. The candle is a free one I got a while back from Kohl’s, using one of my $10 email gift certificates. Let the decorating begin! 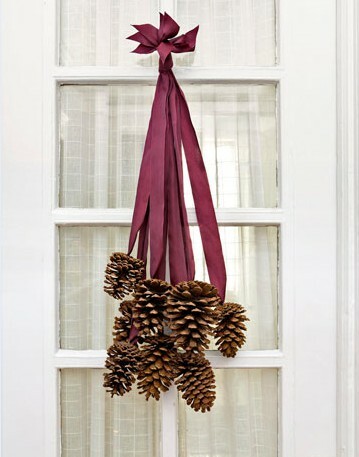 What decorations have you made for fall? 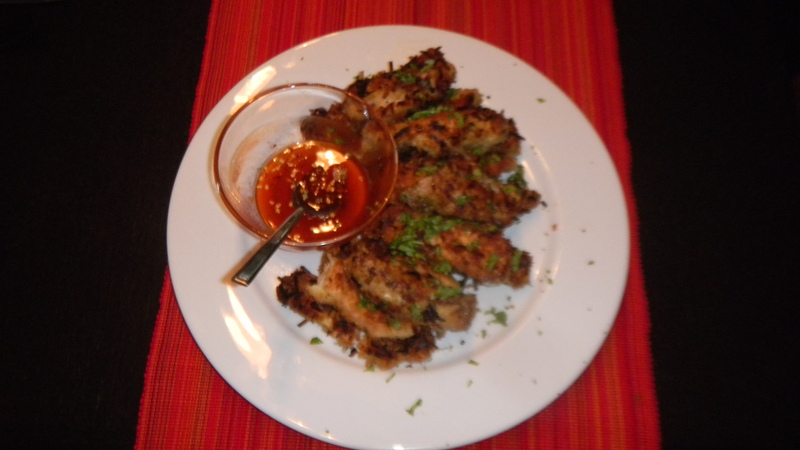 The other day, I stumbled across an awesome recipe website – Budget Bytes. It’s a collection of great recipes keeping your budget as a key factor in her recipe creations. She uses mainly ingredients you should have in your pantry already, which I definitely appreciate. She gives wonderful step-by-step instructions, so I’ll spare you all the details of how I cooked each dish, but I did want to share with you some of the dishes we’ve made, thanks to Budget Bytes. 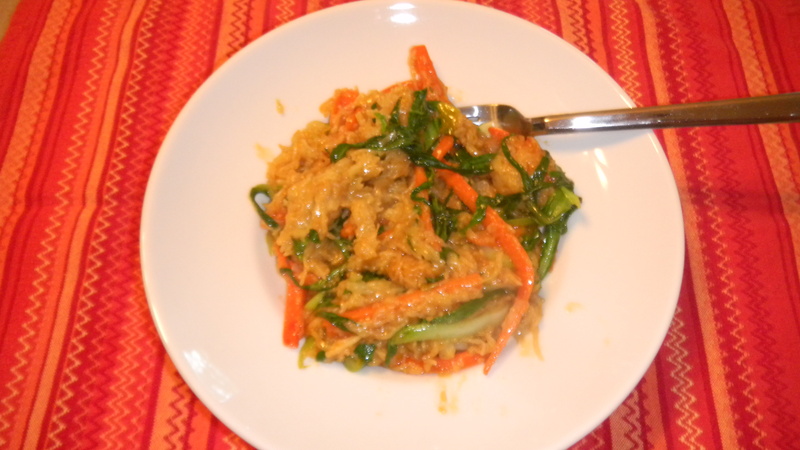 Coconut chicken with our own homemade spicy sauce. For the spicy sauce, we just mixed hot sauce and honey. Yum. This is definitely a new favorite at our house. We tweaked it a bit and used thick spaghetti instead of soba noodles and some sweet and sour sauce instead of hoisin sauce, since we didn’t have either. We didn’t have hot curry powder, so I just used regular curry powder and went heavy on the hot Sriracha sauce. 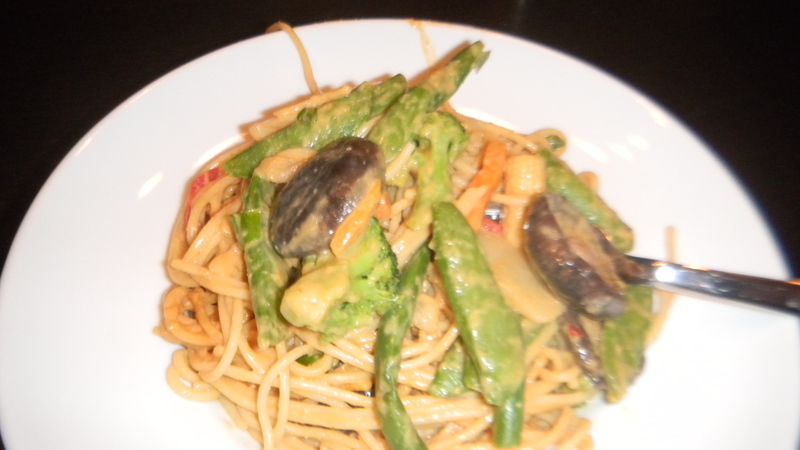 The noodles did have a slightly weird consistency, and they clumped together, though the dish itself was pretty good. I’m hoping to try out the ricotta gnocchi and the roasted vegetable couscous soon too. Let me know if you try out one of Budget Bytes’ recipes.